Gold prices jumped nearly $20 Monday, more than erasing losses from last week. Silver, platinum and palladium rallied as well. Precious metals were lifted, opined analysts, as optimism grew for a U.S. budget deal. That limited safe-haven support for the U.S. dollar and inflated riskier investment appetites as U.S. stocks enjoyed one their best trading days in months. Gold prices for December delivery surged $19.70, or 1.2%, to settle at $1,734.40 an ounce on the Comex in New York. Intraday trading levels were from $1,713.40 to $1,735.50. 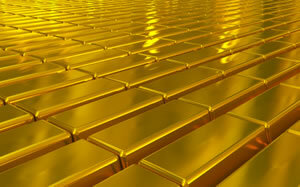 Gold prices last week fell $16.20 or 0.9%. "People are in a ‘risk-on’ mode as they expect Washington to come up with a solution" on the so-called fiscal cliff, Adam Klopfenstein, a senior market strategist at Archer Financial Services Inc. in Chicago, said in a telephone interview that was relayed on Bloomberg. "The situation in the Middle East is also putting some bid under gold." Silver for December delivery soared 81.9 cents, or 2.5%, to close at $33.189 an ounce, trading between $32.285 and $33.210. Platinum for January delivery closed at $1,583.80 an ounce, advancing $22.00 or 1.4%. The precious metal ranged from $1,559.60 to $1,584.70. Palladium for December delivery rallied $18.85, or 3.0%, to $645.30 an ounce, trading between $626.45 and $646.25. Last week silver declined 0.7% while platinum edged up 0.2% and palladium jumped 2.5%. Prices were mixed last week with gains of 0.3% for silver and 1.8% for palladium and losses of 1.4% for gold and 0.3% for platinum. Gains on Monday for bullion coins from the U.S. Mint were limited to American Eagles. Gold Eagles climbed 1,500 and Silver Eagles advanced 32,000. Both increases are on the modest side for a start to a new week but sales during the first half of the month have been exceptionally high. The following table lists the newest daily, November and year-to-date bullion sales as published by the U.S. Mint. Bullion sales above are in the number of coins sold, not the amount of ounces.